DAY 2: Gothtober’s FIRST ANAGLYPH FILM!!! Today’s film is a technological tour de force in countdown calendar films. You can watch Cristin Pescosolido’s film “Swifty and the Atomo-Flora” in 3-D! All you need are a pair of the classic red and greenish/bluish glasses, and you can see the eye-popping action fly out at you! 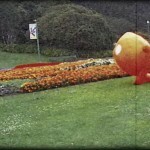 Shot with an HD 3-D camcorder, observe what happens when a visitor from another planet decides to visit our earth! 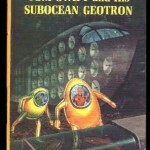 The bright, pumpkin-colored costume is off of Tom Swift and His Subocean Geotron. 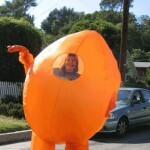 To create “Swifty,” Cristin used orange kite fabric and an excel spreadsheet to help calculate the roundness of each piece of fabric to make an inflatable sphere. Cristin sewed the costume together. Air intakes at the bottom of the suit help fans that sit in mesh pockets within the geotron. You also might notice that the film has only ONE actor, and that’s not a typo. Using her mad digital-compositing skills, Cristin duplicated Jennifer Howard (in the white hazmat suit) running out of the tunnel approximately 7 – 8 times to get the desired effect of a gang of people running. Jen Howard plays Swifty as well. 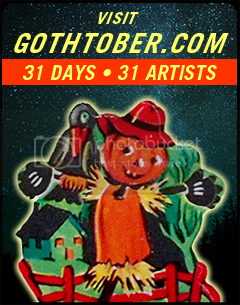 Gothtober Fun Fact: You can find Swifty’s earlier adventures behind DOOR 2 of both Gothtober 2005 and 2006 in the archives.